A group of retired nuns has just wrapped up a pilgrimage of over 1,100 miles to support migrants and refugees — while raising almost $2,000 for archdiocesan Catholic Social Services (CSS) along the way. The 130 women religious reside at Camilla Hall, the convent home and healthcare center of the Sisters, Servants of the Immaculate Heart of Mary (IHM) order in Malvern. Each pledged to walk – or, for the mobility challenged, to wheel — at least one mile a week for nine weeks. 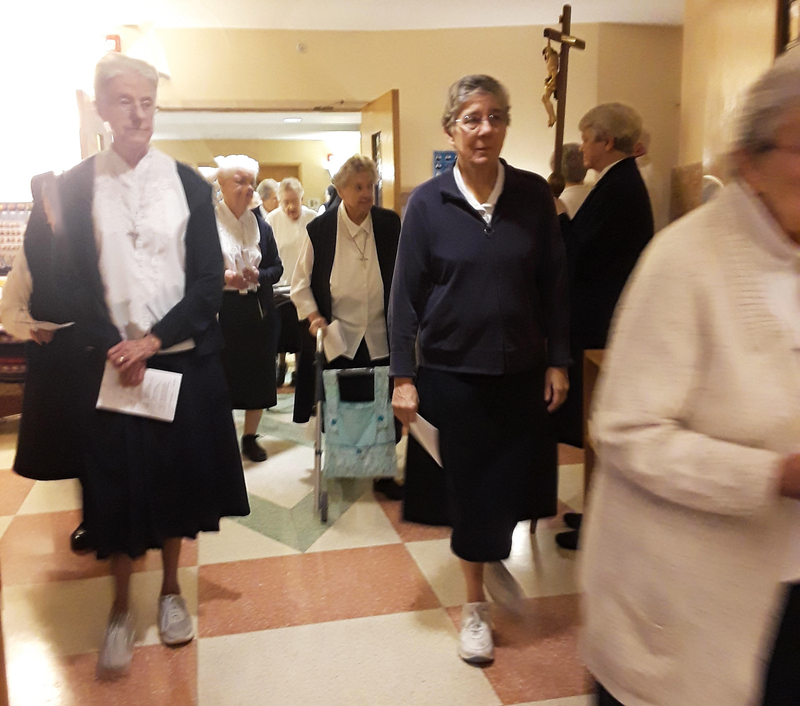 The long hallways of Camilla Hall, which measure 338 feet from end to end, enabled the nuns to rack up 1,170 miles by Nov. 13. “Our pilgrimage took on a different shape than the traditional pilgrimage, but the miles walked, and the prayers offered, are very real,” said Sister Mary Lydon, I.H.M., a Camilla Hall resident who serves as the house’s social justice representative. In her role, Sister Mary coordinates various prayer and advocacy efforts in which the hall community takes part. The hall’s recent pilgrimage was part of Share the Journey, a two-year campaign launched by Pope Francis in September 2017 to increase awareness of, and compassion for, migrants and refugees throughout the world. As part of the initiative, the pope has called for all Catholics to stand with migrants by undertaking a spiritual pilgrimage on their behalf. The global pilgrimage component of the Share the Journey campaign was formally launched in October 2018 by Caritas Internationalis, a confederation of more than 160 Catholic organizations operating worldwide at parish, diocesan, national and international levels. Caritas’ Global Solidarity Walk seeks to collectively total 1 million kilometers in pilgrimages by the end of 2019. After completing their walks, participating groups report their mileage to Caritas via its website. To date, Caritas has tallied just under 29,596 km, making the Camilla Hall group’s miles (which equal 1,883 km) a little over 6 percent of the overall total so far. But according to Sister Mary, the numbers only tell a small part of the story. “We offered each step as a prayer,” she said, adding that “even the very sick sisters,” who could not participate in the walk, joined their supplications to those of the pilgrims. Such prayers were part of an ongoing ministry that has been supporting CSS in its care for migrants and refugees. In the spring of 2018, Amy Stoner, director of CSS’s Refugee Resettlement Program, began receiving cards and letters from the Camilla Hall sisters, assuring her of their spiritual aid. “Just your title … and now the increased number of refugees needing assistance says, ‘You need prayers! '” the sisters wrote in a February 2018 letter to Stoner. Surprised by the unexpected assistance, Stoner set out earlier this year to meet her intercessors, spending an afternoon with them and inviting them to continue praying for her work. As it turns out, the partnership between Stoner and her prayer warriors is a natural fit. “We have retired sisters who are able to pray more because we’re not serving in an active mission,” said Sister Mary. Stoner added that the sisters can in turn see the fruits of their spiritual labors through the Refugee Resettlement Program, which has welcomed 84 migrants and refugees since September 2017. Thoroughly vetted by the U.S. State Department, each refugee is greeted at the airport by CSS staff and volunteers. Within 90 days of each arrival, CSS works to arrange housing, employment, schooling and bank accounts for families. CSS provides a stipend of $1,125 per person, of which $925 is applied to rent and $200 is designated as cash assistance. Each adult keeps $20 and opens a bank account with the remainder. Stoner added that the sisters’ $1907 donation to CSS — $200 of which came from raffling a handmade quilt sewn by one nun — will provide much-needed assistance to families who have recently arrived from Vietnam and the Democratic Republic of Congo. During the pilgrimage, Sister Mary and her fellow nuns also petitioned Pennsylvania Governor Tom Wolf to reverse the prolonged detention of migrant families at a Berks County facility. Above all, Sister Mary said, the Camilla Hall sisters are using their available resources to accompany both migrants and those who support them, creating a true culture of encounter. “Every sister here can be thinking of somebody they know who was a migrant, whether it was a former student, or one of the aides here at Camilla Hall,” she said. Although the United Nations estimates there are currently 68.5 million forcibly displaced persons — 25.4 million of which are refugees — the Camilla Hall residents remain undaunted. More post Vat. II political activism. Let`s use religion to promote what they cannot get through political activism to promote open borders and one world order. A country without borders is not a country at all but then that seems to be the message here. Kind of makes veterans wonder why they ever sacrificed their time and even lives to defend a country that the progressives seem bent to destroy and turn into a Venezuela socialist component of the corrupt central Americas. 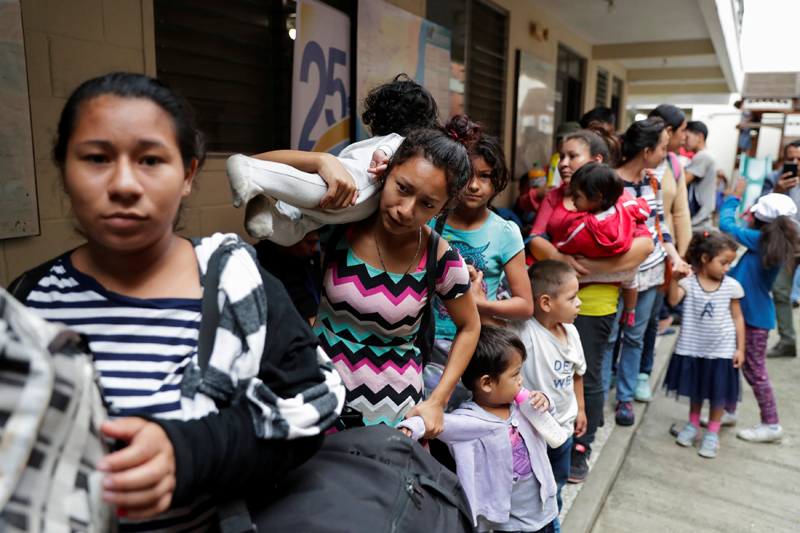 There are legal ways to immigrate to our Country as many of us are indeed sons and daughters of immigrants who migrated here legally not withstanding we are already the most welcoming Country in the world but then who needs laws or borders for that matter, nuns on a bus indeed. Progressives will stop at nothing and use anything to promote their agenda and I wonder how all that left wing socialistic agenda is working out in France or Venezuela right now?, but I suppose we have to somehow make up all the generous billions of dollars of our tax money they were receiving from the previous administration. The Catholic Church used to be a spiritual place to worship God and learn the Scriptures but, sadly sometime after Vat. II it turned into a political Democratic activist organization promoting one world order and Marxist socialist agendas and when over fifty percent of Catholics vote for pro-abortion candidates it speaks volumes about where the Church is. No wonder there are empty pews and closed Churches with current pew foundation attendance figures of less than 28 % Mass attendance you can get all this at a pro-open border illegal immigration rally, who needs Church activism? , many people would just as soon worship at home. How very proud I am of our IHM sisters at Camilla Hall. They believe social justice is love in action–not merely words. And they live it! our congregation since its very beginning. You just can’t beat the Philly IHMs when it comes to putting their voice and their action on the line for justice for all God’s people. What a fabulous idea this has been!!! Thank you, Sisters, for getting involved in such a creative way. Sister Mary and her community are an inspiration to all who know them.